I crave a pop of colour in my food sometimes. Shopping at farmers’ market in summer satisfies that visual longing with rainbow array of fruit and vegetable. Alas, we are in the waning days of March. The best nature can muster is the intense blue sky on the occasional sunny afternoon. I decided to take matter in my own kitchen. Not long ago, smitten kitchen made raspberry coconut macaroons with fresh raspberries. I did a double-take at the girlishly pink orbs and marvelled at Perelman’s creativity. 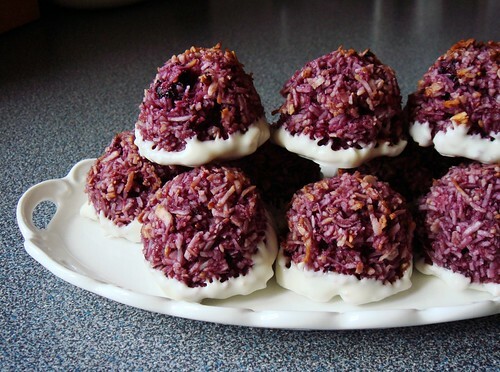 Everyone makes coconut macaroons but who would come up with the idea to crush some berries in the batter? Motivation is a funny thing. Although I was incredibly drawn to the recipe, it simply did not rise to the top of my to-bake list. In fact, I totally forgot about the pink macaroons. 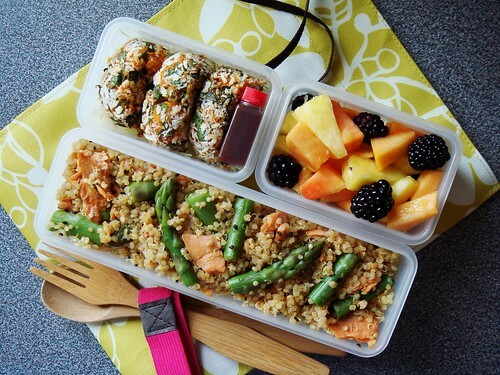 I started packing bento on a semi-regular basis because I wanted to enjoy nutritious homemade food on the go. The aesthetic of a well-made well-balanced bento obviously appeal to me but mainly it is my way of avoiding depressing fast food options when I am not eating at home. The weather is far from balmy here in Toronto but dry pavement means I have already started inline skating outdoor for over three weeks. When training wraps up, I am famish! Since I am not a fan of protein shakes, bento is one way for me to battle the post-training-munchies. This is the bento I packed today with a hint of spring. Any avid jam maker can tell you it is all too easy to overstock the larder. I try to keep mine in manageable supply which explains why I am down to my last jar of apple butter. That beloved batch was made with lots of apple cider vinegar. At first, the apple butter tasted too sharp to my liking. But a few months in, the flavour mellowed and I grew to really like it. I wanted to use it for something special. It is now maple season in eastern Canada and saps are flowing. Maple baked goods are everywhere I look. Last weekend I stopped at Cora’s for brunch. On my way out, I picked up a recipe card that caught my attention. 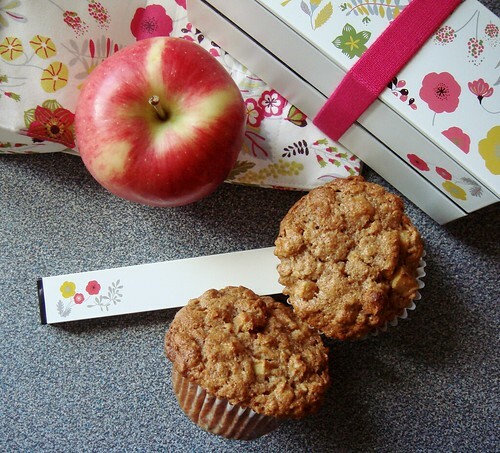 It was a recipe for Apple and Maple Muffins, “the ideal lunchbox recipe”. I generally don’t get distracted by randomly distributed recipes but something about the ingredients spoke to me. Three things were aplenty: diced apples, maple syrup, oats. The recipe actually sounds healthy! It was midnight and I was searching for cabbage recipes from my cookbook library. For reasons unknown, I started flipping through Tish Boyle’s The Good Cookie. Obviously my favourite cookie resource did not fulfill my quest for cabbage goodness but it offered something even better. 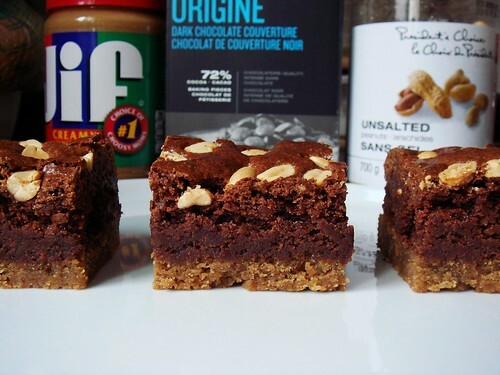 In the Bar Cookie chapter, my eyes lingered over recipe after recipe of brownies in their many guises. I felt the rise of the familiar midnight brownie craving and there was nothing I could do to stop it. I really ought to be in bed but the promise of soft fudgy treat was tempting. First, I only cut some parchment paper to line the pan. Innocent enough and I could stop what I was doing at any minute. There’s never any harm in having another prepared pan, right? I glanced at my pantry and realized the sugar containers were low. Oh, why not just top them up so they would be ready the next time I bake? My sugar jars were obviously too small and I had some leftover in the paper bag. My gaze fell on the recipe once more. Without even thinking, I converted the volume measurement to weight and scaled out exactly the amount of sugar I needed for Peanut Butter Chocolate Brownies. Consider my love for entertaining at home and my love for brunch, you would think I would host brunch at home more often. Apparently, that is not the case. Weekends are prime time for training so it is rare that I get to spend mornings at home at leisurely pace. When the opportunity comes around, I am more likely to enjoy the luxury of sleeping in. Dad suggested to meet for lunch last Saturday at my favourite bubble tea place. Despite the draw of sleeping in on a weekend morning, I invited him over for brunch instead. That was an impulse decision I made late Friday morning. Within the span of 24 hours, I came up with the following menu and a precise schedule to get everything done on time. It is rare that I bake the same thing more than once. Only recipes that yield spectacular result and those that I personally crave receive repeated appearances in my kitchen. My favourite financier recipe occupies such an esteemed place in my repertoire. For those unfamiliar with this French pastry, I like to describe it as a tea cake. It is a cross between cake and cookie. There is no leavening agent, just a cooked batter of beurre noisette (browned butter), egg white, ground almond, sugar, and flour. It is often made into small bite-size servings as a dainty accompaniment to tea or coffee. Such simplicity yet so much room for creativity! I played around with this master recipe in many different ways. This week, I found a new variation that I simply cannot get enough of. Last weekend I enjoyed great success with my Black Sesame Yuzu Pear Tart. The rich nutty taste of black sesame contrasts so beautifully with yuzu poached pears. However, making a tart can be a little involved and I wanted an easier way to experience this winning combination. 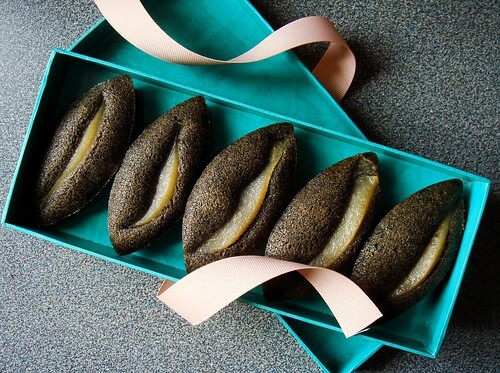 Entered my Black Sesame Financier with Yuzu Poached Pear. I had been giddy with excitement and chanting “Pie Pie Pie” all week. Our monthly supper club met again today for an early Pi(e) Day (March 14) celebration. This was our biggest get-together yet this year! 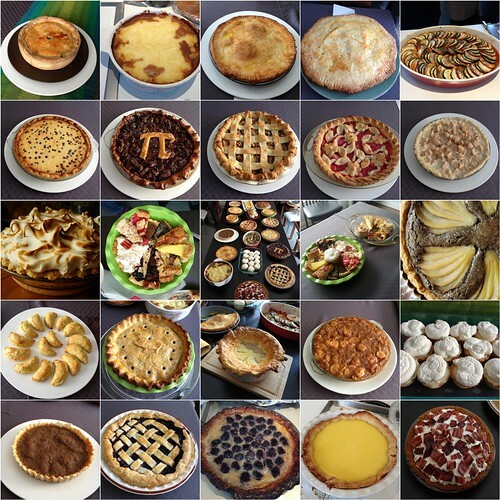 It was a potluck of pies. Sweet or savoury? Double or single crust? Butter, lard, or shortening? 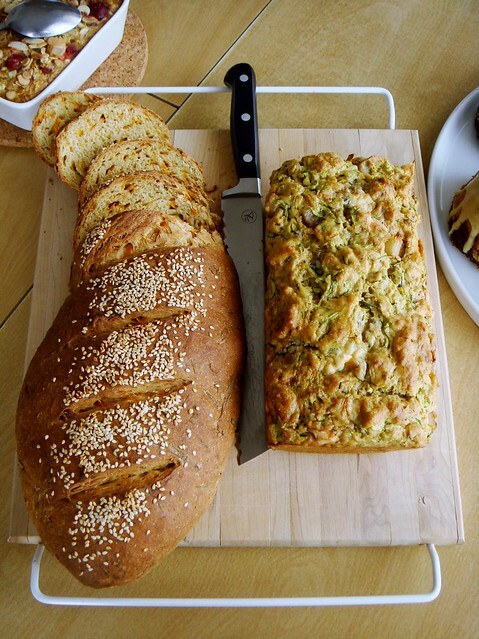 It was baker’s choice and the variety everyone brought to the table was staggering! 14 bakers and 23 pies, can you say epic? Yup, this is what epic looks and tastes like (you can read more about our party at Bon Eats) It’s not easy to stand out among so many delectable pies. Although spring is upon us, I still have citrus on my mind. I chose to feature the refreshing Japanese yuzu in two different forms. I made a Yuzu Meringue Pie with all butter crust using European-style high butterfat butter and billowy brown sugar Italian meringue. As much as I love every single component of this pie and its majestic good looks, I did not budget enough time for the filling to set. There was zero structural integrity! It was a fluffy cloud of deliciousness best served with a large spoon. However, my other creation is the reason for this post. I made a Black Sesame Yuzu Pear Tart and couldn’t be more pleased with the result. 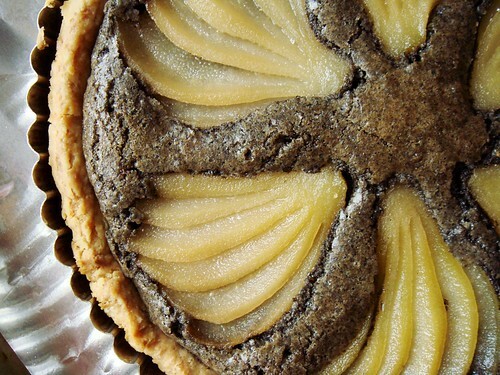 It is a Japanese twist on the French patisserie classic pear tart with frangipane. Pate brisee tart crust, yuzu peels, black sesame cream, and yuzu-infused poached pears may look unassuming. But the contrast between rich and nutty black sesame, creamy pears, and aromatic yuzu was unexpected yet harmonious. I love presents, you love presents, everybody loves presents! One of the main reasons I became a jam-maker is to have a stash of homemade gifts at the ready all year round. Sure I love to give a box of assorted cookies (labour intensive) or a jar of jam (jam again? ), but recently I want to branch out. My first name is a giveaway that confectionery holds a special place in my heart. Candy By Candy sure has a nice ring to it! 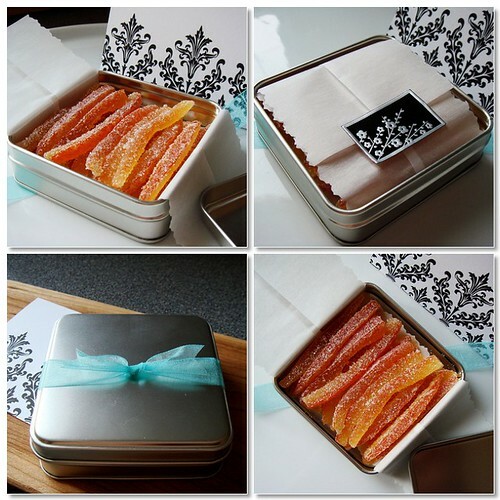 My latest foray into the world of candy making is candied citrus peels. I don’t know why I thought candying citrus peel would be difficult. I made countless batches of marmalade before, even in someone else’s bachelor kitchen. I put up jars of candied kumquats. I have no fear of playing with heat and sugar. This is a classic treat to introduce newcomers to the wonderful world of homemade candies. My race season officially began last Sunday with Burlington’s Chilly Half Marathon. Granted, it was only a running race thus not my main sport inline speed skating. But a race is a race and it was a hard one. I am proud to report that I achieved my time goal even though just fell short on my placement goal. My chip time of 1:49:24 is quite respectable considering it had been two years since I last ran 21km/13.1mi. My training does not focus on running at race pace for such long distance so I am more than happy with my result. You probably heard of runners carb loading before a marathon and the traditional pasta dinner evening before a race. There are lots of science that support different approaches to better performance but I will not bore you with that. As a general rule of thumb, I do not eat anything special to prepare for workout under two hours. Just a nutritionally balanced meal of familiar food is enough. 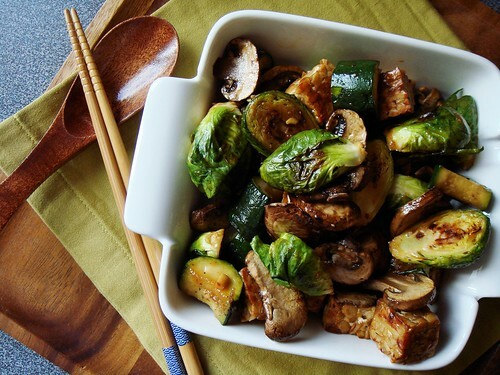 I enjoyed a hearty Tempeh Brussel Sprouts Stir Fry in Maple Sriracha Glaze. I love it so much that it should not be limited to pre-race fuelling. You would think running a half marathon gives me license to pig out after the race. Alas, that was not to be. I wanted to visit a schnitzel house but was shivering so much that I ended up having a pedestrian three egg breakfast with peameal bacon. The race is named “Chilly Half” for good reason! It was –5C and I was freezing as soon as I stopped running! Well, at least the coffee warmed me up nicely.